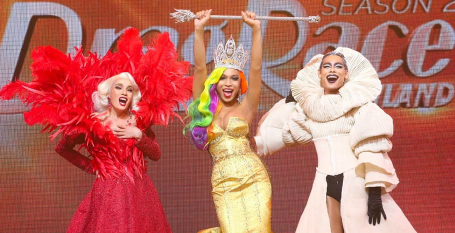 For the first time ever, a transgender woman has won Drag Race Thailand, where Angele Anang secured the top prize when the second season ended on Friday (5 April). With her win, Angele is also the first ever trans woman to land first place in the history of the Drag Race franchise. Co-host Pangina Heals posted about Angele’s win on Instagram, where she wore an epic and sparkly crown atop her rainbow wig. Angele also looked stunning in a dramatic gold mermaid dress.